Is it really almost the end of October already? 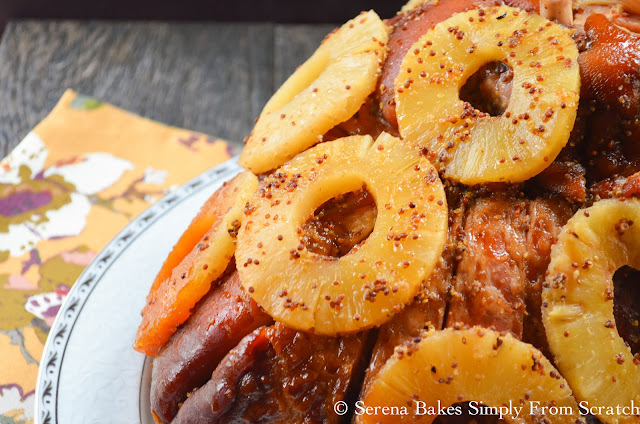 Time always seems to go way to fast, so I thought I better share our families favorite Slow Cooker Pineapple Honey Mustard Baked Ham before Thanksgiving and Christmas are upon us. I'm one of those weird people that start menu planning like a month ahead of time so I figured if your like me I better get the recipe to you now! 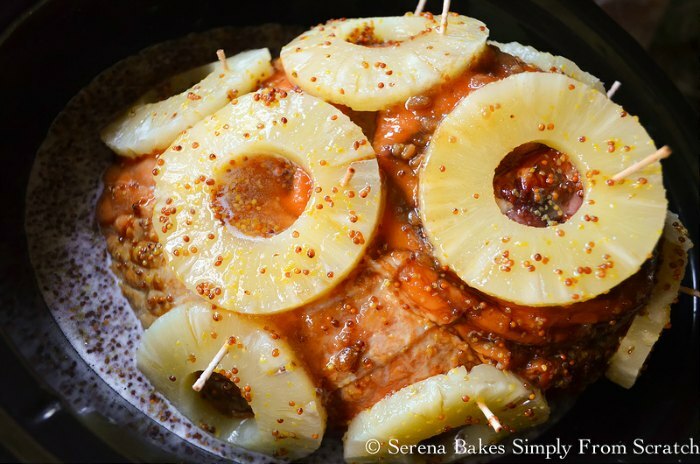 I've been craving Slow Cooker Pineapple Honey Mustard Baked Ham for the last few weeks and couldn't think of a better excuse to make a Ham then I was sure your ready for ham too. I made Colt drive out to our favorite meat shop 2 weekends in a row because they were sold out of ham the first trip. Lucky for us they had 1 ham left the second trip or Colt might have told me to give up the craving. It's not like I can pull the pregnancy craving card anymore! I highly suggest calling around to your local butcher to see if they carry locally dry cured ham, you'll be amazed at the flavor difference. The one from our local butcher is so much more flavorful and less salty then anything I've come across in the supermarket. The flavor just can't be beat! I love all the leftovers for Ham Sandwiches plus to make Tuscan Ham and Bean Soup or Crock-Pot Chipotle Ham and Bean Soup. It's always like 3 meals in one! I usually will bake Ham in the oven at 325 degrees for about 20 minutes per pound but over the last few years I've been using the slow cooker more and more since it leaves room in the oven if I'm also making a Turkey or Roast Beef plus it's easy to do and requires very little maintenance. Either way you cook this Slow Cooked Pineapple Honey Mustard Baked Ham you just can't go wrong. 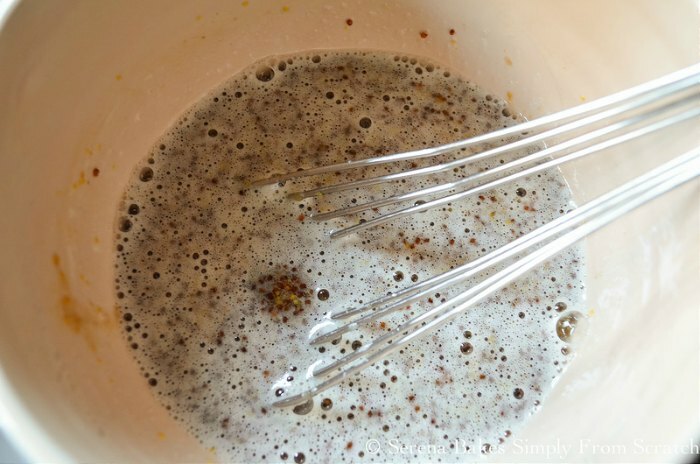 Mix together 1/2 cup Brown Sugar, 1/3 cup Grainy Dijon Mustard, and 1/3 cup Honey until sugar is well incorporated and smooth. Then whisk in 1 cup Pineapple Juice until well combined. I buy a 20 ounce Can of Pineapple Rings in 100% Pineapple Juice and use the juice from the can. Next you'll need your Main Character "The Ham".. Dun..Dun...Duhhh... Sorry I'm feeling rather dramatic today and felt like we needed a little excitement! 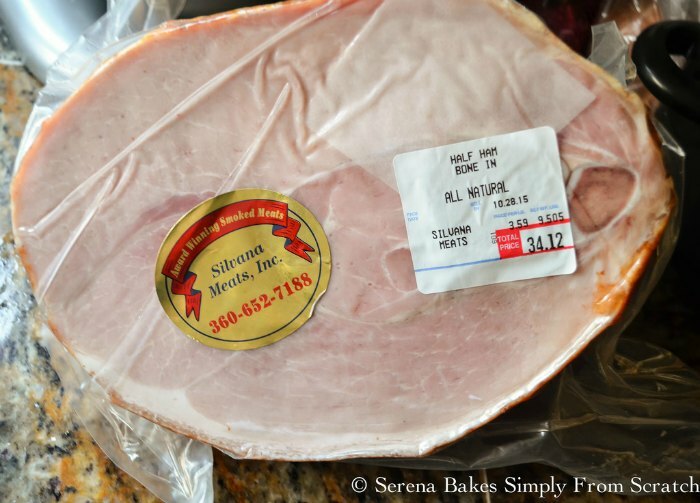 This post is in no way sponsored just for the record I just truly love Silvana's Meats Ham! I usually buy a Half Ham Bone In this one just happened to be on the heavier side at 9 1/2 pounds. I'm sure that's why I was lucky enough to find the last ham.. Most half Hams seem to run between 6-10 pounds dependent on the cut. Using a sharp knife carefully score the skin going through the fat to form a diamond pattern. I find this helps let our Pineapple Honey Mustard Glaze to soak into the Ham. 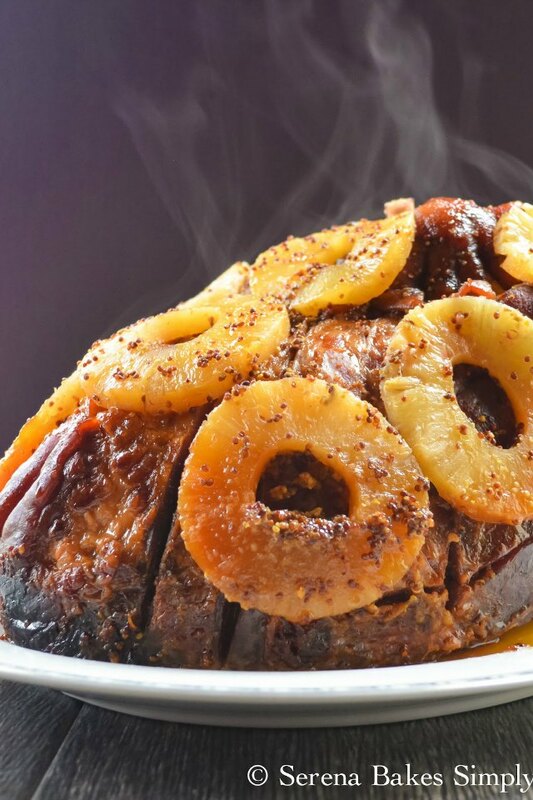 Place Ham cut side down in Slow Cooker and use toothpicks to attach Pineapple Rings evenly around ham. Make sure to leave toothpicks sticking out of ham for easy removal. Pour Pineapple Honey Mustard Glaze evenly over ham and cover. If ham is to large and crockpot lid won't fit snugly use aluminum foil sealed tightly around edge of crockpot to cover. Brush glaze over ham ever 30 minutes to an hour being careful of hot steam that might escape. Cook on low for 5-6 hours until heated through to 140 degrees or 150 degrees if your Ham is marked Cook Before Eating. Carefully remove ham from crock-pot, remove toothpicks and tent with aluminum foil. 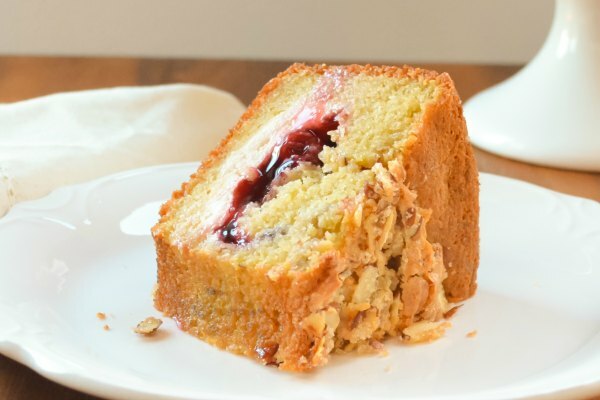 Allow to rest for 10 minutes before slicing. Ham will continue to cook and temperature will increase an additional 10 degrees while resting! Slice that bad boy and serve! I hope that if you were fearful of making a Ham you now see just how simple it is. Slow Cooker Pineapple Honey Mustard Baked Ham is probably one of the simplest things you can make and a family favorite in our house! Slow Cooker Pineapple Honey Mustard Ham is easy to make and perfect for those times when you don't have oven space. 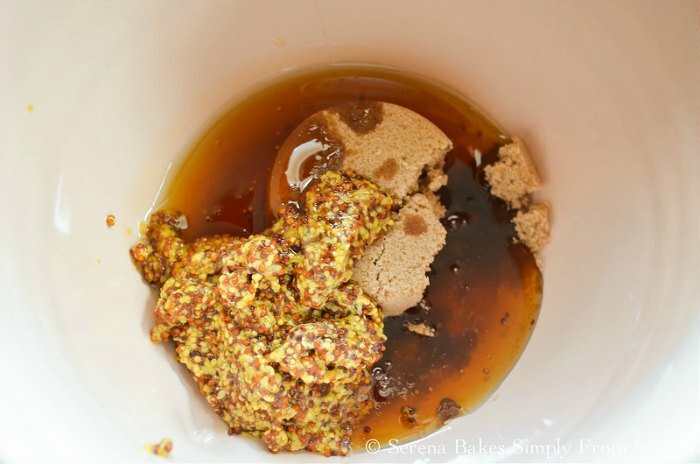 In a small bowl stir together brown sugar, mustard and honey until well combined. Whisk in 1 cup pineapple juice from canned pineapple. 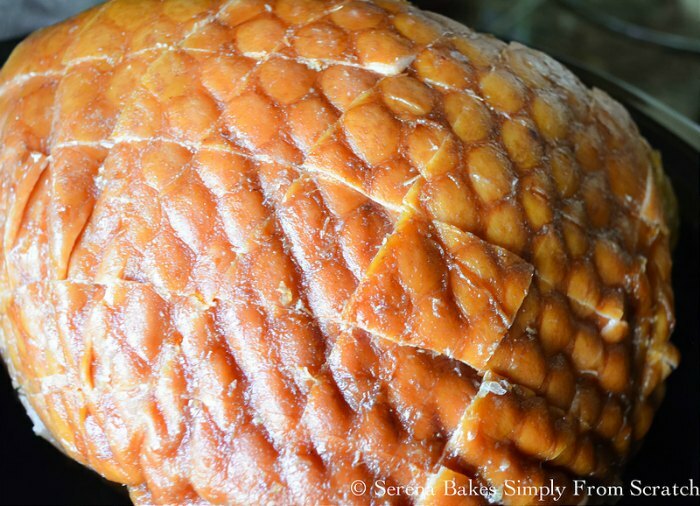 Score ham through skin and fat in a diamond pattern. Using toothpicks place pineapple rings over ham skin. Place ham cut side down in slow cooker. Cover evenly with pineapple honey mustard sauce and cover. If lid won't fit on slow cooker cover tightly using foil. Baste ham every 30 minutes to an hour. Cook on low 5-6 hours until heated through to 140 degrees or 150 degrees if your Ham is marked Cook Before Eating. Remove ham and tent with foil allowing to rest for 10-15 minutes. Ham should increase in temperature an additional 10 degrees while resting. Remove all toothpicks from ham before serving. 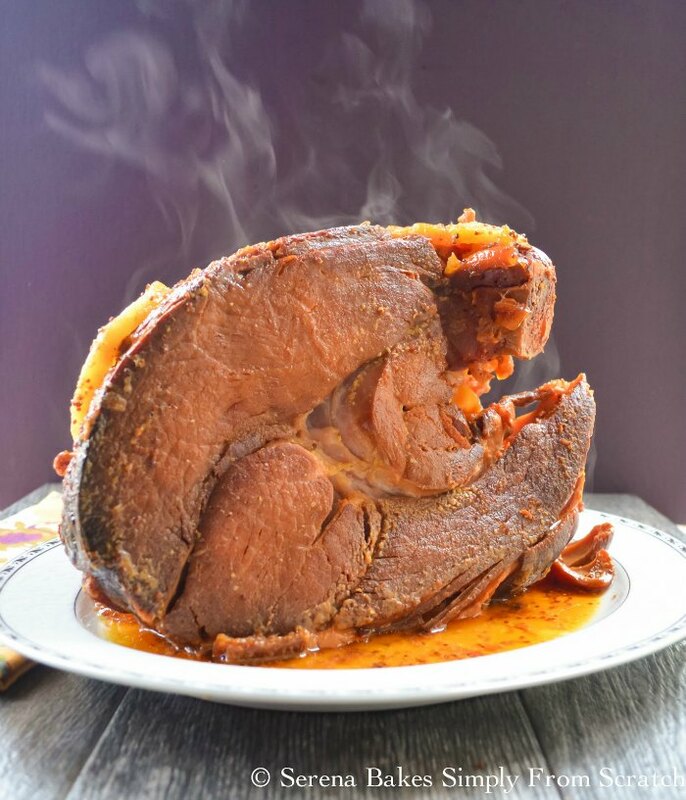 That is a great looking ham and I love how you captured the steam coming off it in your photos! I love ham and this one looks spectacular! I always just opt for a HoneyBaked Ham and serve it room temperature, but I'd love to change things up and try your ham this year! I was just telling the hubs the other day that I feel like making a ham! I've never made on in the slow cooker before. I love that idea! Your ham looks and sounds delicious, Serena! 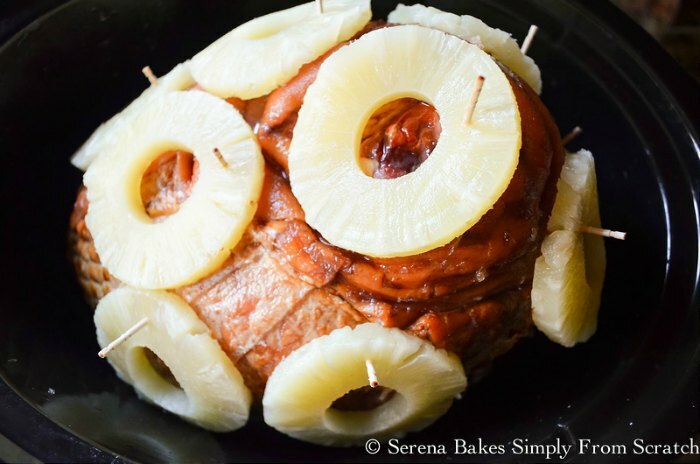 I have never made a ham in the slor cooker, but I love the idea. That way it would leave my oven free for the zillion side dishes I always make. 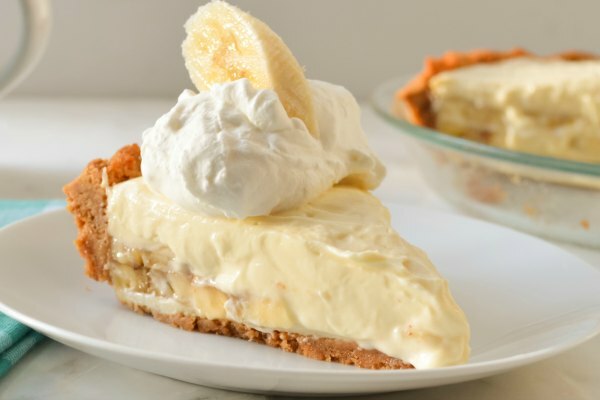 This recipe sounds so great - I make one similar, but I have also not add the pineapple which I will probably do now that I see yours! Why didn't' I do this for Thanksgiving? Instead, I overbaked the ham in our side oven and never got to do the glaze while the turkey in the main oven while fumbling around with heating up all the side dishes in the microwave oven! I'll know what to do for the next holiday! I love pineapple with ham as well! 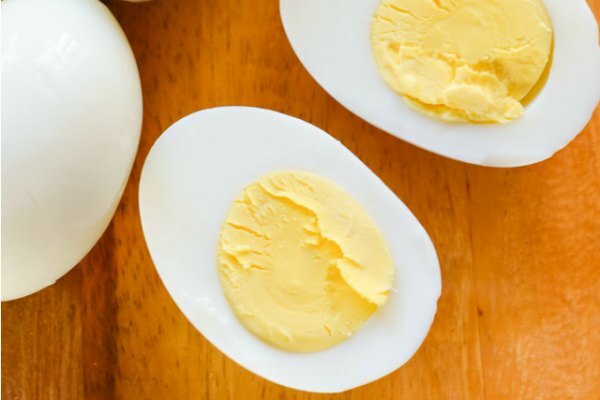 I was excited to try this for Easter so my oven would be freed up. I used a 10lb. ham ($29.00) and followed the recipe. I sorry to say, mine did not turn out delicious or as shown in the photo's. Mine seemed to come out as if it was "boiled" and had no flavor. Not sure if it's my crock pot, or to much pineapple.